As far as I'm concerned, there will never be enough nursing memes. They perfectly embody the snarky humor that gets a nurse through rough days. This is a list of the top ten funniest nursing memes that the collective mind of the Internet has to offer. Of course nurses can't use restraints without a doctor's order, but the reference to a risqué novel certainly is titillating. Remember when these memes were absolutely everywhere? Everyone from moms to Stormtroopers (yes, from Star Wars) had a mini-collage of photos to demonstrate what they were really about compared with the perception. Well, nurses were not exempt, as evidenced by this nursing meme. 8. Oh, You're a Nurse? Simply mentioning to people that you are in nursing school will earn you the details of their latest physiological anomaly. Be prepared for a lot of TMI. After a while, you will forget there ever was such as thing. 7. Want to Help Place a Foley? The little girl's face captures the innocence; the hopeful anticipation and sweetness that you pray will make your coworkers have mercy on you. Foley catheters are indwelling catheters that need to be inserted into the urethra and set in place with a fluid-filled balloon — all while maintaining sterility. It's kind of a big favor to ask a coworker who has plenty to do. C. diff, or clostridium difficile, is a normal gut bacteria that is kept low in numbers by other bacteria in the gut. A few antibiotics later and your patient may have horrible diarrhea that you can smell from across the hall — and hand sanitizer won't kill C. diff. 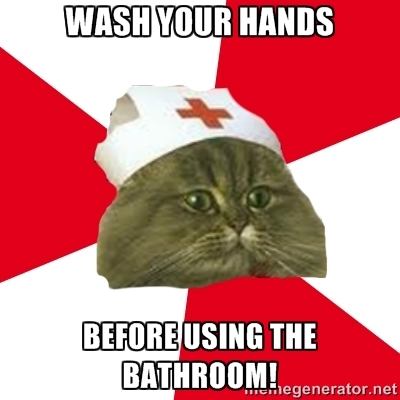 So, a thorough hand washing is in order after every contact with a patient affected with C.diff. Your gut and your nose thank you in advance. Privacy is extremely important in healthcare, but private areas are in short supply. A curtain and a low tone is the next best thing. 4. Did I Mention Wash Your Hands? See C. diff, as mentioned above, plus all manner of unimaginable diseases that you don't want anywhere near your mouth or body. There is a lot of hand washing in nursing, in case you didn't know! So true. So sad, but so true. One of my favorite nursing memes about the dirty little secret of nursing school: No one does all the assigned readings, and there are dire consequences for those that try. Isolation rooms require brand new Personal Protective Equipment — usually a paper gown, gloves and goggles, every time you go in. You'd be surprised how hot that getup can be when you are trying to take care of a patient or fix an IV pump. Nursing memes abound in the world of nursing, but there are still plenty more witty phrases and hilarious observations to be made. So keep at it, nurses of the world — a little humor goes a long way!